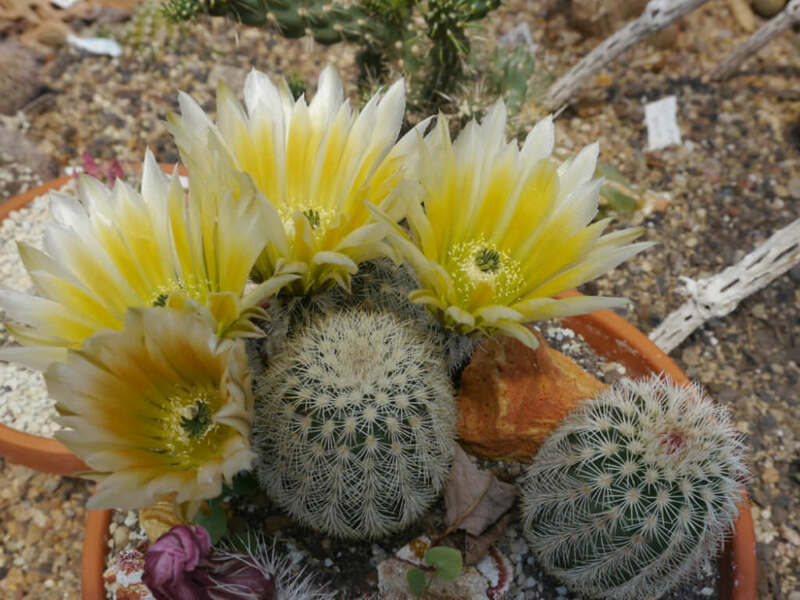 Texas Rainbow Cactus, Spiny Hedgehog Cactus, Spiny Hedgehog, Golden Rainbow Hedgehog Cactus, Golden Rainbow Hedgehog, Yellow Pitaya Cactaceae (Cactus Family) Synonym(s): Echinocereus ctenoides, Echinocereus dasyacanthus var. hildmannii, Echinocereus pectinatus var. ctenoides, Echinocereus pectinatus var. dasyacanthus, Echinocereus pectinatus var. neomexicanus USDA Symbol: ECDA USDA Native Status: L48 (N) The Texas rainbow cactus is oval at first, soon becoming cylindrical, and grows to 15 inches or so, with a 4-inch diameter. The stems commonly remain single, but old plants sometimes branch and form several heads. Each head has 12-21 narrow ribs. Fifteen to 25 spines grow out of the areoles, spreading widely and intertwining with those of other areoles. Flowers are about 3-6 inches long and are pale yellow to orange. Petals are quite long and pointed. Outer petals are sometimes tinged with magenta on the outside, and inner petals are streaked with green on the inside. The base of the petals is green. The stamens are cream- colored.